The Vogafjos Guesthouse is a lovely accommodation close to Myvatn, a volcanic lake situated in the north of Iceland, not far from Krafla volcano, surrounded by wetlands with an exceptionally rich fauna of waterbirds. This North Iceland accommodation is perfect as a base from which exploring the unspoilt nature of Myvatn and its numerous sightseeing attractions, such as the Hofði Nature Park. Or what about a culinary experience at the on-site Vogafjos-Cafe where you can taste smoked char pate with Geyserbread or the taditional Icelandic ponnukaka cake with whipped cream and blueberry jam. Delicious! It's up to you! 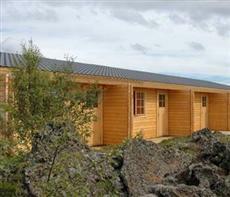 You have the choice to arrange your stay in Iceland as you prefer the most. Hotel amenities at the Vogafjos Guesthouse also include wireless Internet connection, and the extraordinary opportunity to watch the cows beeing milked in the morning and drink their fresh warm milk!